(NaturalNews) As the corporate media desperately attempts to dupe as many people as possible into getting MMR (measles, mumps, and rubella) vaccines for the protection of "the children," uncovered court documents revealing major vaccine fraud at Merck & Co., the multinational drug company that produces MMR vaccines for the U.S. market, are only getting the attention they deserve from the alternative media. Back in 2010, two former Merck scientists, repulsed by what they saw taking place at the highest levels of the company, filed a False Claims Act in the U.S. District Court for the Eastern District of Pennsylvania. The filing accuses Merck of lying about the safety and effectiveness of MMR vaccines, tampering with study data, defrauding the U.S. government and various other high-level crimes. Claims by Merck that the mumps component of the MMR vaccine is "95 percent effective" are also questioned in the filing. Stephen Krahling and Joan Wlochowski say Merck senior management falsified data specifically on the effectiveness of the mumps vaccine, intentionally spiking blood samples with animal antibodies in order to trick the public into thinking that the vaccine is effective. "Merck... added animal antibodies to blood samples to achieve more favorable test results, though it knew that the human immune system would never produce such antibodies, and that the antibodies created a laboratory testing scenario that 'did not in any way correspond to, correlate with, or represent real life... virus neutralization in vaccinated people,'" explains CourthouseNews.com. Other alleged transgressions include Merck swindling the U.S. government out of "hundreds of millions of dollars for a vaccine that does not provide adequate immunization," as well as promoting the spread of mumps with its fraudulent vaccine. This elaborate scam, which the duo says has been taking place since the late 1990s, has allowed Merck to monopolize the vaccine market, specifically with regard to MMR vaccines. "For more than forty years, Merck has had a de-facto exclusive license from the federal government to manufacrure and sell a mumps vaccine in the U.S.," explain Krahling and Wlochowski in their lawsuit against Merck updated in 2012. The only way Merck was able to gain this monopoly in the first place was by demonstrating to the FDA that the mumps vaccine is at least 95 percent effective. According to the federal agency, this is the designated threshold at which so-called "herd immunity" is activated, supposedly providing near-total protection against infection. Initial tests failed to reach this necessary threshold, so Merck resorted to data manipulation and blood sample tampering, the false results of which were submitted to the FDA as evidence of the vaccine's efficacy. For years, this was all kept tightly under wraps, only recently emerging into the public sphere -- and yet the mainstream media has completely ignored it! "Krahling and Wlochowski participated on the team that conducted this supposedly enhanced test," reads the original filing. "Each of them witnessed firsthand the falsification of the test data in which Merck engaged to reach its 95 percent efficacy threshold. In fact, each was significantly pressured... to participate in this fraud." Those doing the pressuring included Merck Senior Investigator David Krah, as well as his second in command, Mary Yagodich. Merck's executive director of vaccine research, Alan Shaw, is also named as having "approved the testing methodology Krah and Yagodich employed." If this isn't enough, Krahling and Wlochowski say there weren't even any proper controls used with this already contentious testing methodology. Senior scientists just arbitrarily decided to add rabbit antibodies for the sole purpose of increasing the virus neutralization count, thus making the vaccine appear more effective than it actually is. The payoff for acting as accomplices in this heinous criminal operation were "significant bonuses," according to the filing. Emilio Emini, Vice President of Merck's Vaccine Research Division, promised the team involved with the "enhanced" testing scheme "very large bonuses" for the work they had already completed at the time -- and once it was all done, Emini told the staff that they would receive double bonuses. In an honest world, the federal government would have immediately responded to such allegations by prudently launching an investigation. Instead, federal authorities completely ignored this False Claims Act filing against Merck, allowing it to disappear into the system, further demonstrating how the government operates in lockstep with this corrupt industry. "Since 2000, the CDC has... paid Merck more than $700 million for its MMRII vaccine," adds the 2012 filing. "These amounts likely underestimate the CDC's total purchases because they do not account for purchases of ProQuad, which is significantly more expensive than MMRII, Mumpsvax, or purchases of adult doses of Mumpsvax, MMRll and ProQuad, which Merck also sells to the CDC. 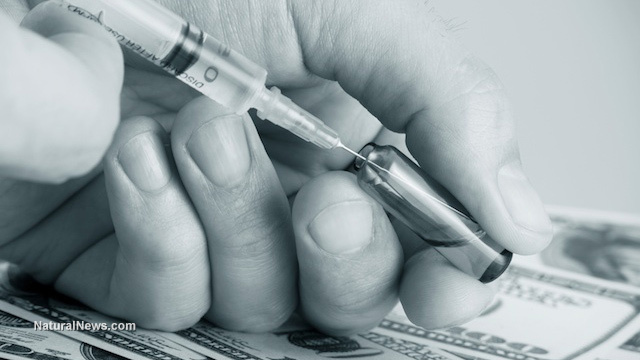 Over this period, the U.S. has therefore paid more than three-quarters of a billion dollars for a mislabeled, misbranded, adulterated and falsely certified vaccine that does not provide adequate immunization."